From the Activities section in your QF site you will be able to create activities, edit them again and again, run Real-Time activities (as an alternative to running them from Q-Launcher) or launch Self-Paced activities, and you'll also use this area to review Results from activities you have run at any time in the past. Create Activity On clicking the "Create Activity" button, you'll be presented with a screen allowing you to set the properties of this activity. Give the activity a title which makes it easy to identify later. Real Time vs Self Paced You will have to choose between making this either a "Real Time" activity or a "Self Paced" activity. In a Real Time activity, you (the facilitator) and the participants are attending at the same time. The Facilitator is posing questions on their own, or batches of multiple questions. The participants respond to these questions (or batches) as they are asked. Results are made available to the Facilitator in real time. If the activity is desired for a specific group of participants, you can set this here. 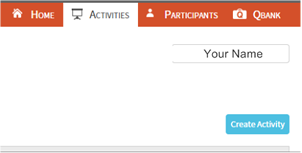 You can set how participants can access this activity (do they use an ID which you have set, or can they access by just creating an "alias" or nickname?). You can also decide how participants will receive feedback. You can change all of these choices later very easily, including just before you run the activity. On selecting "Create Activity", you return to the Activities page with your new Activity selected, and waiting for you to create questions. Creating Questions You can import questions from your Q-Bank directly into this activity (or, if you have questions in a CSV format, you can load those into the Q-Bank). 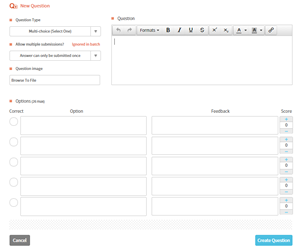 For now however, we'll concentrate on creating questions, so press the "Create Question" button to view the Question creation form. Choose between the various Question Types available. With the possible exception of Hotspot questions (discussed next), the question types are very commonly used so you will probably be very familiar with the formats; if not then access the relevant section of our User Guide for step-by-step help. Upload any required images. Remember that on mobile phones especially, it is preferable for images to be wider than they are high, so that the participant does not need to scroll far if at all to get to any functions needed below the image). Creating Hotspot Questions deserves some special attention. The first step is to determine whether one, or multiple "hotspots" are to be clicked by the Participants, and from this choose the relevant Question Type. Next, "Browse to file" to upload the image which will be the focus of the Hotspot Question. To generate a Hotspot, start clicking on the image. Lines joining the clicks until a loop is closed, delineate the clickable zone (the hotspot). As soon as a loop is closed and a zone thus formed, a feedback element is created in the table to the right of the image. Here you can leave or remove the "correct" selection, assign marks, and provide feedback to be supplied to students selecting that zone. Organising the activity As questions are added, these simply attach to the last question in the activity. To re-order the questions, just press the up or down arrows to the left side of the question. Batches In the case of Real-Time activities, questions can be organised into batches. 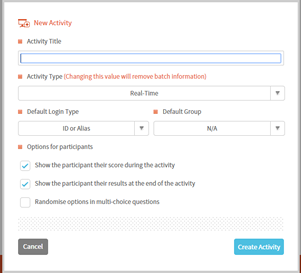 A batch is launched all at once by a Facilitator in a Real-Time activity, so that participants can then answer the questions within the batch at their own pace. Use the "Join" button to join adjacent questions into a batch. Once questions are "joined" they appear together in a frame which represents the batch. The batch can be labelled to make it easily identifiable. 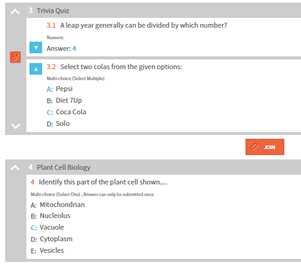 Questions can also be split away from the batch using the "split batch" button in the far left of the frame. By now, you have a set of questions organised as you want them, and ready to go. Remember that you can change all of the properties of this activity whenever you want to. You're ready to run a live session with your own activity! Coming up: Your next installment in "Xorro-Q in 7 Bites" is all about uploading your participants, and organising them into groups. By providing your participants with IDs, you'll be more confident of knowing which participant is which. Just as importantly, you'll be able to extract helpful reports and track participant progress over multiple sessions. Groups are analogous to courses or classes, and allow group-wide administration values and reporting. Read ahead if you like!